Equine Therapy is the practice of using horses as sources of healing. You may have seen on the news recently that horses are being used to help flood victims deal with their trauma. A couple of weeks ago I was lucky enough to attend a workshop called Seeing With Fresh Eyes run by the lovely people at Horsanity. I’ll have more photos from the day posted soon but I wanted to write about it while it was still fresh in my mind. This was a clinic based on the principles of equine assisted therapy. Now that The Crossroads is out in the big, wide world I’m working on a new novel and I attended the clinic for research purposes. 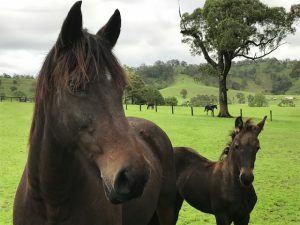 In the yet-to-be-named story my skeptical main character, desperate to help her grieving foster daughter, takes her to a neighbouring horse property only to find that spending time with the horses helps her deal with her own unresolved issues. 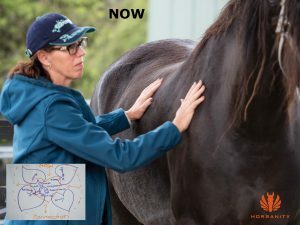 While I certainly didn’t go along to the workshop with any level of skepticism – I’d read up on the topic and have been around horses long enough to know how therapeutic they can be – I did end up getting more out of the day on a personal level than I did for my research. How do I Have A Deeper Connection? Initially, because I’d attended as a ‘writer’ I focused on what this question meant for my writing. Being set in the country, and containing romantic elements, my novels have all fallen into the Rural Romance category but they have also dealt with issues to do with family, grief, friendship and a number of other social issues. They all feature strong female protagonists dealing with issues from their past as well as tackling problems in the present. In my future novels I want to take this a step further, delve more deeply into issues affecting women – relationships, motherhood, abuse in all its forms, discrimination, loneliness – along with the themes I’ve already mentioned. While exploring this was my intention for the workshop, the experience became much deeper and more personal. One of my earliest offerings to the group was the great loss of connection I feel since losing my best friend to MND 18 months ago. Not something I intended sharing when I rocked up there, pen in hand, that morning. As we talked further other longings revealed themselves to me: a longing to spend more quality time with family and friends, a longing to talk about more important things than the latest Facebook post or reality tv show, a yearning to talk about things that really matter. We were guided through a series of sessions which explored the various systems we operate in. For me this included family, writers, readers, students and friends. Alternating between group discussion and spending time with the horses we were encouraged to be conscious of our thought patterns – were we operating in the sensory, thought or emotion zone? Could we move smoothly between the three or did we find ourselves stuck in one zone of awareness? What I noticed was my tendency to ‘live’ in the thought zone, constantly thinking of what I have to do next, what I will write next, where I have to be ‘next’ rather than operating in the NOW. When we were taken out to meet the herd of gorgeous friesians we were instructed to do nothing but ‘be’. We let the horses do whatever they chose without trying to guide or coerce them in any way. One approached me and then left. And I thought that was it until we re-formed the group and a second horse came up to me – and wouldn’t leave me alone! I wanted a closer connection and that’s what I got! I felt a sense of safety and security despite the size and persistence of the big boy. It was okay to get that close, to be that open. In a later exercise we spent time grooming the horses. 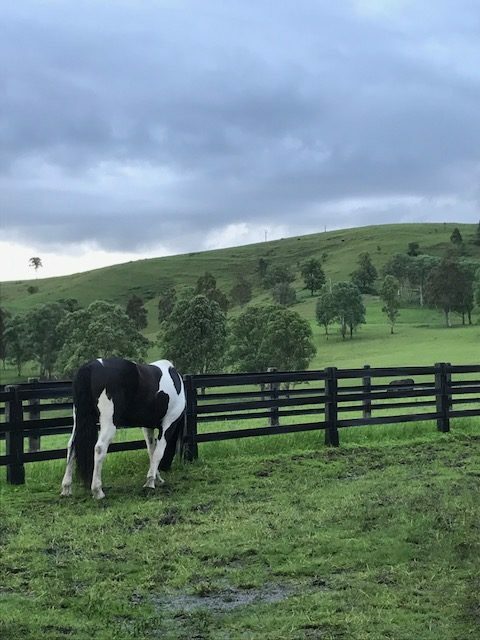 Now this is something I do often, but doing it in a mindful, present way made the task so much more meaningful – for me and I’m sure for the horse. I’m taking away a determination to be more present, in all areas of my life. STOP. LISTEN. OBSERVE. BE. And a realisation that my writing is not an isolated part of my existence … it needs to be grounded in my awareness of the life around me … in order to connect you have to listen. For me, writing has always been about connecting – to myself, with my readers and with other writers. Sometimes, in the rush to meet a deadline, to get the next book out, I forget that. But now, seeing myself with fresh eyes, I plan to slow down, pay attention and truly connect. Would love to hear your thoughts on different ways of connecting. Please leave a comment. Apart from the horses my other way of connecting is though shared vision. That is I endeavor to present the world as i see it though my photography. I don’t want you to see me (the outside) so no selfies in front of things, but rather to feel the emotions and feelings I felt (my inside) as I gazed up on something. Do I succeed – sometimes! Photography is a great way of connecting. It says so much about the photographer and gives a real insight into their perspective. Clearly I do not connect through correct spelling! Through! Through! What a lovely experience for you Pamela. Especially that you got so much more out of it than you thought you may. Being present is something few of us remember to do, but if we do, the payoff can be so very rewarding. Each day I try and spend a few minutes just being. Not doing anything, not thinking, just being. I’m also trying to be more mindful to bring that present connection into everything I do. For me it is about listening and noticing but I find I can on truely be there for the other when I am grounded in myself. To do this I do what I know supports me, my values and my beliefs. If I can show up and listen to me then I can truely be there for the other connecting in a way that is honest and real. Then there is food. I like to connect with food and sharing my experience with others either in the kitchen or at the table.